There’s reason to be both optimistic and pessimistic about the United States IVD market, depending on what sectors one wishes to focus on. Despite persistent challenges to the U.S. in vitro diagnostics (IVD) market, advanced testing segments can lead a bounce-back delivering growth to test innovators—suppliers and labs alike. Chief among recent disappointments in U.S. IVD market performance has been the disruption of histology and molecular markets, previous mainstays of high revenue growth. 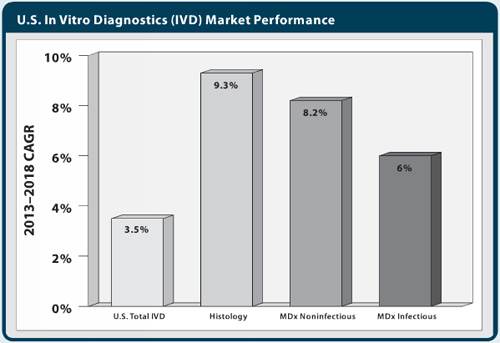 Recovery in the U.S. IVD market will depend in large part on the contributions of histology and molecular diagnostic testing segments, which are projected to grow by an average of 7.5% per year through 2018. Market expansion for these advanced diagnostics segments will be a result of test introduction and the stabilization of coverage and reimbursement decisions and procedures on the part of payers.